Cask: Regular. Also available bottle conditioned. A true old fashioned stout. A dark combination of malt and roast with some hops. Strongly flavored and well balanced. Ingredients: Maris Otter pale malt, wheat malt, roasted barley. Northdown, Yakima, Galena and Goldings hops. Nice stout for the price. 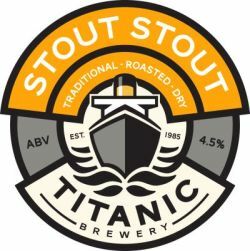 UPDATED: JAN 20, 2019 Cask (4.5%), 1/2 pint by hand-pump at The Raven, Glasgow on 11 Dec 2018: roast malt, molasses aroma, opaque near black, good beige head, roast malt, dark chocolate, burnt toast, very subtle medicinal flavour, creamy, malty finish. Keg at the Sir Robert Peel, Leicester. Orangeish brown, very translucent with a cream-coloured head. Light coffee scent, with some ash, chocolate, caramel. Sweet taste, almost too sweet. Some pleasant sourness in the finish, with sarsaparilla, Camp coffee and blackberry in the aftertaste. Thin, thin body. Tasty enough but inconsequential. Cloudy black beer, low carbonation, small head, at nose several roast notes such as chocolate and coffee there are also some fruity ones like plum, at palate is nedium body with a nice aftertaste full of burned flavours and a slight bitterness. Pours a clear dark brown, almost black with thin tan head and average carbonation. Aromas of strong roasted malts and coffee. Taste is full-bodied, the beer is quite smooth in the centre but the strong roasted malt and coffee flavours come through very strongly leaving a lingering bitter finish. My personal preference for stouts is to see some more sweetness coming through for balance; this one leans too much towards roasted and bitter flavours and doesn't have much malt sweetness/chocolate flavours to balance. Pours a finger of head on a black body. Aroma is licorice, coffee and dark chocolate. Taste is deep and dark bitter coffee. Really nice. Texture is thicker. Tried at the Craft Rooms Lincoln. Jet black colour with a tan head. Roasted malty bitter with a touch of choc. Taste is light sweet to big roasted bitter.